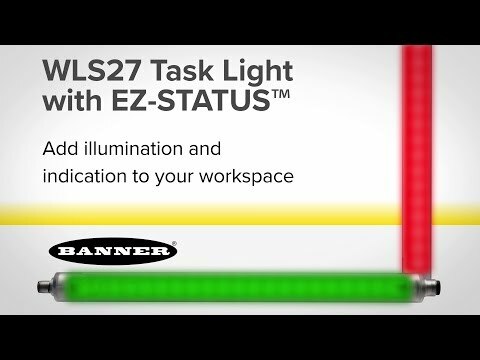 MINNEAPOLIS, MN, January 9, 2018 – Banner Engineering, a leading provider of technology for industrial automation, today announced the release of WLS27 Multicolor LED Strip Lights with EZ-STATUS™ that perform both illumination and indication functions for machines and workstations. The latest additions to the WLS27 Series have the same robust build and compact form factor as other light fixtures in the WLS27 Series, but feature LEDs in multiple colors that can be configured for illumination and indication. The bright, even illumination provided by these LED strip lights increases visibility throughout an area, improving productivity, efficiency, and safety. Any change in light color is an unmistakable, visual alert to a change in status, enabling a quick response and resolution to any event. WLS27 models with EZ-STATUS are available in three- and five-color models in combinations of white, red, yellow, green, and blue. They come in four lengths, from 285 mm to 1130 mm, and have a space-saving design for use in confined areas and tight spaces. The lights utilize a standard 4-pin M12 connector and have multiple mounting options to simplify installation. Cascadable models can be powered from a single source, making it easy to quickly deploy and power multiple lights. Like other LED light fixtures in the WLS27 Series, multicolor models with EZ-STATUS feature a durable aluminum internal structure and a shatterproof, UV-stabilized, polycarbonate shell for a long, maintenance-free operational life. Every strip light in the WLS27 Series has a rugged IP66, IP67, and IP69K construction suitable for use in applications where exposure to high-pressure, high-temperature water, solvents, cutting oils, and corrosive chemicals is common. The versatility and heavy-duty construction offered by WLS27 Multicolor LED Strip Lights with EZ-STATUS make it easy to improve visual awareness on a wide range of equipment, in work areas, at entry and access points, and in any location that would benefit from high-visibility illumination and indication. Banner's new WLS27 Multicolor LED Strip Light with EZ-STATUS™ retains the round, rugged design of the original WLS27 providing a long work life in harsh work environments and washdown areas. Add versatility to your lighting application. Install a single light for illumination and indication, simplifying your spare parts list and improving visibility.